Researchers at the UPM have developed a carbonaceous material from sewage sludge that when applied to soil can help to improve its quality. 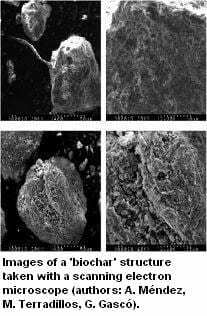 The material is called biochar and was prepared and characterized by the research group of Resource Exploitation of the Technical University of Madrid (UPM). The biochar has promising effects because its addition can enhance the quality of soil, and consequently it can enhance crop yields. In addition, it has beneficial properties for the environment. The generation of sewage sludge is increasing and its management and treatment have been studied over the last years. Among the different usages of the sludge in countries such as Spain, where soil has a low content of organic material, we should stress its direct addition to soil. However, there are some factors that threaten this practice due to high level of salts, metals and organic compound which can even be toxics. Researchers at the group of Resource Exploitation of the UPM have been working on the preparation and characterization of the biochar for several years. They also worked on the biochar from sewage sludge and also the effect of physical, chemical and biological properties of the soil, as a result improving this material. The obtained results so far are quite encouraging as they show how the addition of biochar to soil can enhance its quality (for example, its ability for moisture retention, pH or biological activity) and therefore, to enhance crop yields. April 13, 2019 - Company looking to bring biochar plant to area | News, Sports, Jobs The Inter-MountainBUCKHANNON — Biochar had been around for 4000 years when it was first created by the Amazon River Indians to improve agricultural yields, but it's only. April 17, 2019 - Raving about research Golf Course Industry MagazineChicagoland superintendent Dan Dinelli spreads his zest for science at the New England Regional Turfgrass Conference & Show.